We jumped on the bandwagon and bought into the new healthy lifestyle hype. My husband and I purchased Fitbit Flex's for ourselves. I hate making set resolutions. I will work out more. I will lose this much weight. I will stop eating junk food and eat only healthy food. Making those types of resolutions never really work out for me. I'll do it for a month or so, and then slowly fade off. I actually tend to do better when I'm not making any resolution, just start with no expectations and no real end game, except to be healthier in some way. For me, I think it's just too much pressure. I know there really isn't a consequence at the end if I don't finish, but I tend to feel really guilty when I stop. So, it's easier to try to do my best everyday, and not have a set diet, restriction, or goal (except to be healthier). My husband and I started looking at the Fitbits, as an easier way to hold ourselves accountable. There are a ton of features that you can get, and use on these little bands. 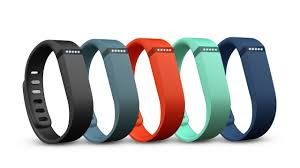 For me, though, I'm mostly interested in the step counter, and the sleep tracker. There are a lot of other features, such as adding water intake, calorie intake, showing how many calories you've lost, active minutes, miles, weight loss and more. The actually band on this style, only shows dots. The dots represent the percentage of steps that you have gotten towards your goal. With just two quick taps, it shows you about how far along you are. To get a more accurate number, you can just look on your phone app, or the website. I always have my phone with me so I love this. I love that you don't see an actual number on your band. I feel like thats too concrete and daunting. Like, "Ugh, I still have 2,732 steps to go" as opposed to, "Oh, I'm on my 5th (final) dot, so I must be close! There are obviously times that I do want an actual number, so this is when having it handy on your phone is fantastic. The step counter seems to be very accurate. I'll count how many steps it takes for me to walk from one room to another, and that's exactly how many got added to the counter. Also, when on an exercise machine, I was afraid it wouldn't add those as steps, but it does (at least on the elliptical). You can change your goals day to day if you want. I started with a goal of 8k. When I started hitting that regularly I bumped it up to 9k. Ideally, I'd like to get to the recommended 10k, but again, I'm not trying to give myself to many goals for fear of giving up on it. Usually about an hour before bed, or even 20 minutes if I know I'm close, I'll check my numbers. If I haven't hit it yet, I'll get up while watching TV, and just start walking in place. Easy as that. No running, no having to go to the gym, and no having to deprive myself of snack foods. I may not be losing a ton of weight, but I'm also not gaining anything since I'm keeping myself just active enough. The sleep tracker is the other thing I mentioned earlier. I love this. At night, you just tap the band until it vibrates and two dots flash which signifies that it is in sleep mode. It then will track, pretty accurately, how long it takes you to fall asleep, how many times you were restless, how many times you were actually awake (and for how long) and how long you were totally in sleep mode. You do have to remember to tap it again in the morning to get it out of sleep mode. It actually will recognize when your not asleep anymore, but it may be a little off if you don't manually do it. I find the sleep tracker very interesting. With having a one year old, I'm still getting up twice a night. So this way, I can see how much sleep I am actually getting. Ideally, you could adjust your sleep to hit your goal hours, but I really can't. I just need my son to sleep through the night! Finally, Fitbit can be very motivating. They have badges that you get for hitting certain milestones. Notifications will pop up on your phone saying "Congrats, you've achieved this badge". Or, it will encouragingly tell you, "Only this many more steps to hit your goal!" You can add friends to your network and have contests with them to see who gets the most steps. Overall, I really like the Fitbit Flex so far. It's great for people like me who just want to make sure they are getting in enough activity each day, and it's also great for those who have actual weight loss goals to keep track of all their numbers. This was one of my better days where I hit 10K by 5pm! Three Children Can't Be That Hard.....Right?